Jenny would stretch out for hours on the sand, rolling back and forth to feel its course, graininess rub against her body. Although most people hate the sensation of the sand that sticks in their swimsuits and between their toes, she relished this feeling. The coarseness of the sand continued to remind her of the breeze, the sun, and the sound of the waves. She didn’t want to lose them, even if they were kept only through this residue. She loved the beach. Her parents lived close enough to the ocean that they could drive there a few times a year, but were far enough away that every trip presented itself as a surprise and a treat for Jenny. The four hour drive kept her in suspense as she tried to imagine the feel of the sand between her toes. As the artificial breeze of the air conditioning circulated through the car, she desperately tried to imagine the sea breeze and hear the sound of the waves as the miles passed under the car. There is one other thing I should tell you about Jenny and the beach. She hated the water. She couldn’t swim well. Although she was only seven, her parents had taken her to many swimming lessons at the local pool. The harder she tried with her strokes, the more she just sank like a lump in the water. Besides, she really didn’t like getting wet. “How can you like the beach so much and hate getting wet?” her Dad asked, a wry smile on his face—the one he always used when he teased her. Phil liked to tease Jenny, and even to give her a hard time. This was his way of relating to her. Although he might have liked to be more genuine with her, as a father he found he really didn’t know how to show to her affection—emotional or physical. He himself had only two brothers and their father was hard on them, even callous. He blinked this thought away.. Swimming, in particular, brought out his most bitter sarcasm. He had been a successful swimmer on his high school and college team. How could his daughter only sink like a lump in the water? Besides, he resented only having a daughter and thought she needed to toughen up a bit, to stop being so emotional. His wife was quick to defend her daughter, especially when it came to swimming. While Phil was a competitive swimmer, his wife understood the fear of water. Visions of her daughter drowning visited her regularly, and left her petrified. . Therefore, for her own reasons, she had supported all of the swimming lessons, even though they had seemed to fail. Jenny clutched the door of car tightly, fearing the ordeal promised by her Dad, all the while trying to recover her peaceful thoughts of the beach. The looming threat of the water disappeared as Jenny hit the sand. As quickly as the sand toys fell to the ground, she stretched out her body and rolled around in joy. The hot grainy feeling exhilarated her, overriding the shooting pain of the burning sand. It was a perfect day—warm, though moderated by a cool breeze, and bright, with the sun reflecting off the water—though just a hint of dark clouds could be seen toward the horizon. Within an hour lunch had been laid out on a blue and white-checkered picnic blanket. Jenny devoured a piece of watermelon to quench her thirst, as she placed her egg salad sandwich on a paper plate behind her. As she indulged in the second piece of watermelon the screeching gulls startled her. They had found the sandwich and were greedily making off with it. Jenny jumped up and chased them away, but only fragments of the broken sandwich and yellow smears remained on the plate. After lunch, in order to gather the water her sandcastle required, Jenny inched down toward the water. The threatening words of her Dad returned to her and she stopped a good ten feet before the edge of the waves. The tide was receding and the sand there was wet. 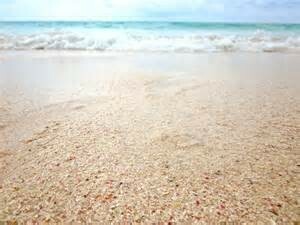 Her toes dug into the wet sand and a sinking feeling of disgust crept over her. Inside her gut the sticky, pasty feeling of the hard, cold sand contrasted with the soft warm feeling of the sand up above. An ominous feeling swept over her as the bucket fell lifelessly from her fingers. She wouldn’t have been able to tell you how long she stood there staring at the waves before her Dad’s hand slapped down on her shoulder. She jumped back, her arms, legs, and neck tangled in a convulsion..
Panicking, she tried to run away, but her Dad’s grip was too tight. Her arm went limp as he pulled her behind him. The first wave crashed against her and her hand tightened its grip for support. The wry smiled returned to her Dad’s face. “How does that feel?” he asked. Before she could answer he sent her sailing as he declared, “Time for a swim.” “Let’s see the results of those swimming lessons!” he laughed as she hit the next wave. Her Dad’s cruelty cut her sharply, just as the cold water of another wave toppled over her head. Defiant, she sought to show him that she could swim and would not be daunted by the water. She shot forth, taking the best strokes of her life. As she did so, she felt proud, a pride taken not in her ability to swim, but rather in the face of her Dad. These strokes were her response to all his harshness—all the sarcastic and short tempered comments—to his resentment toward her. She felt newly independent in the midst of this defiance. Her head bobbed up from the water, with eyes blinking from the salty sensation of the water. The stinging water and her squinting put her slightly off balance. She hadn’t gone far and was hopping back toward her Dad when another wave hit her from behind. In seconds she was at the bottom, unable to orient herself. The undertow caught at her torso and limbs, pulling her—in a panic—farther away from her Dad. She flailed helplessly, no longer able to swim against the current. Panicking she wanted to call out for her Dad, but instead began to swallow water. And then, just as suddenly as she was swept away, everything stopped. Jenny’s panicked sensation died away. The sound of the water, the darkness with the brightness penetrating in from above, had a calming effect on her. She felt peaceful in the water for the first time—more peaceful even than on her beloved sand. She wasn’t afraid, even though she wasn’t sure her Dad could find her in the dark water and she was forced further and further away from him. It was as if a hand had reached down to her and upheld her in some hidden way, even as she felt infinitely far from everyone else. Then she felt a leg, a real leg, and then hands around her, grasping her out of the water. Her Dad had found her. Her Dad carried Jenny toward the picnic blanket, as her Mom jumped up from the checkered blanket. “Phil, I just knew this would happen! I knew she would drown. I told you to leave her alone!” Neither husband nor daughter answered. Jenny still couldn’t register the sounds around her and didn’t notice her Mom’s voice, which quickly faded as she saw her daughters face. She tried to take Jenny out of her husband’s arms, but Jenny was gripping him too strongly. Her head was up against his chest and she could hear his heart beating, quickly and strongly. It was the closest she had ever felt to him. And yet, it was also the farthest, infinitely far, as if she were still out in the sea, in the deep, looking back at him. She woke up out of these thoughts and could hear again. The gulls. Their screeching was mixed with choking sounds. They had thrown up the egg salad sandwich all over their cooler. The sound of their choking, the sight of the yellow muck, and the smell of its rottenness were too much for her. She started choking herself, until she threw up the salt water she had swallowed. The clouds that had seemed so far off earlier that day now struck the shore. It was evening and Jenny walked down the boardwalk, holding her father’s hand. The wind no longer blew gently and coolly, but hit the shore roughly, even shrilly, striking like a cold dagger. The waves crashed harshly as they walked near a retaining wall. One violent wave sent water spraying over the wall. As some of the water landed on her foot, she jumped up into her Dad’s arms, seeking comfort and protection. The sound of the wind and waves had brought back to her the power of the dark depths of the water. Fighting off new tears, she clutched her Dad even more tightly. Her relation to him had changed as well. She had taken him for granted; they had even resented one another. This day had brought their first explicit confrontation. The distance between them had faded away, while a new one had entered. Jenny realized that he could not protect her from everything, but he had saved her this once. He had saved her not only from the water, but also from her prideful rebellion. It is true that he had pushed her to it, but as he drew her out of the water, it was as if she was reborn to him. She realized that she needed her Dad, but also that he is only a small part of the world. She had encountered the depth and darkness of the world, of something larger and more mysterious than anything she had ever known. She had encountered the feeling of being lost, infinitely lost, and also of being found again. Her Dad had saved her, but she remembered that other presence she had met. It was that presence, that guiding hand in the darkness, which enabled her to cling to and appreciate her Dad anew. Riding home that night, she laid her head against the door of the car. Having left behind the rough sea, the sky was clear again, and moonlight shown softly in the sky. A comforting feeling overcame her, reminding her of that hand that had touched her in the sea. Her head drooped down and she fell asleep. But Phil did not hear his wife. He was looking up at the same moon, experiencing a newly found peace.